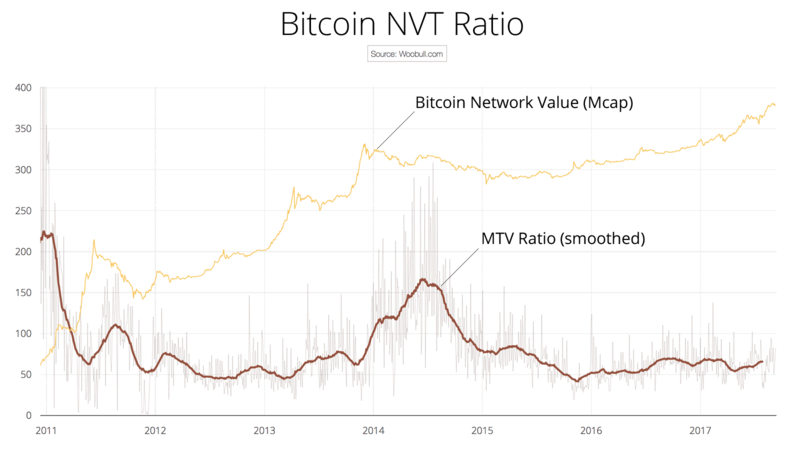 February of this year, I tweeted a chart that presented the idea of a PE ratio for Bitcoin, something I temporarily called MTV Ratio before my buddy Chris Burniske suggested the less confusing term of NVT Ratio (Network Value to Transactions Ratio). Later in May, Chris was the first to present NVT Ratio at Token Summit 2017. Subsequently, this ratio has been mentioned in blog and media articles across the web. In my original tweet, I promised an article; it lay unwritten until now. In traditional stock markets, price-earnings ratio (PE Ratio) has been a long standing tool for valuing companies. It’s simply the ratio of a company’s share price to its equivalent earnings per share. A high ratio describes either over valuation or a company in high growth. What would be the equivalent in Bitcoin-land? We have a price per token, but it’s not a company so there are no earnings to do a ratio. However since Bitcoin at its essence is a payments and store of value network, we can look to the money flowing through its network as a proxy to "company earnings”. As you can see the value transmitted on the Bitcoin blockchain is closely tied to its network valuation. The idea that we can use the money flowing through the network as a proxy for network valuation is valid. We can express this as a ratio. I call it NVT Ratio, short for Network Value to Transactions Ratio. 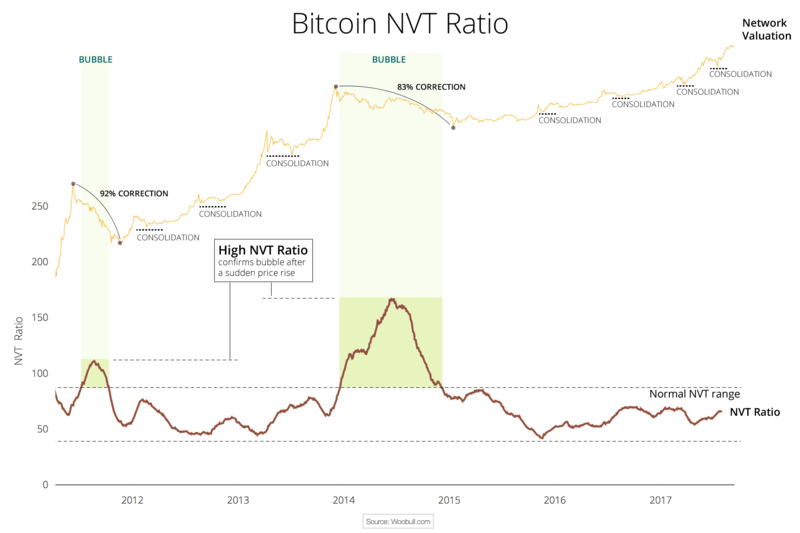 Below is a historic chart of Bitcoin’s NVT ratio. A live and interactive chart is available on my site at Woobull.com. We can see in the early years of the Bitcoin network, growth was very steep. This resulted in the markets valuing the network high in comparison to the actual transaction value flowing through the network. In other words, we're seeing a network growing explosively which then demands a premium valuation based on future potential. This is very similar to what we see in PE ratios in the high growth stages of young companies. 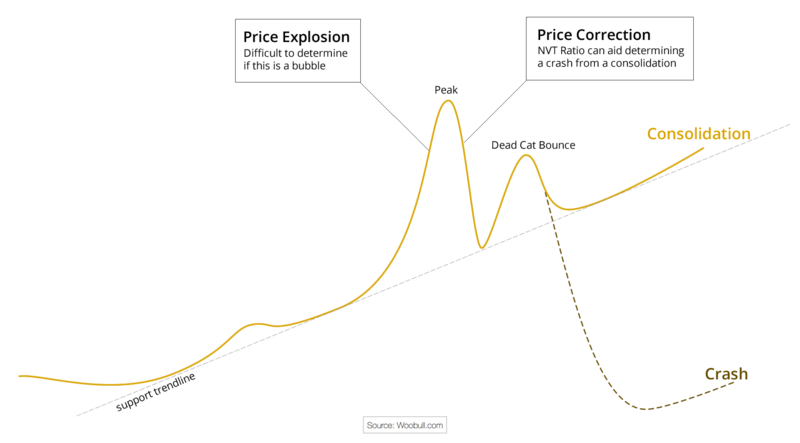 Predicting a bubble before the fact is rather elusive as a price explosion does not necessarily mean the asset is in a bubble. We can only determine this after the peak when the market reassesses the new valuation and we see if the price consolidates or crashes. For example Ethereum’s valuation during Q1 of 2016 grew by a factor of 15x from $70 million to well over $1 billion. To the uninitiated, it looked like a bubble, yet there was no crash, its new valuation was sustained, thus it proved not to be. 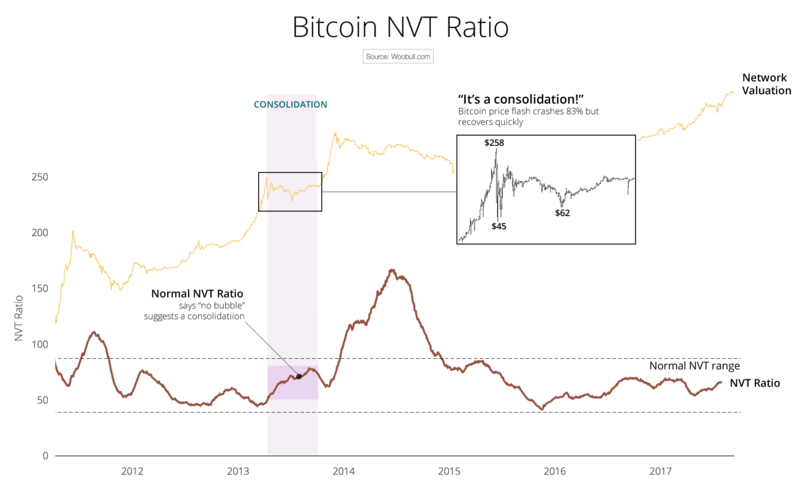 Similarly, NVT Ratio can not reliably determine a bubble ahead of time, but it is very useful for discerning between a crash or a consolidation after the price has peaked. It can determine this relatively quickly. During a price explosion there’s a short term flurry of trader activity and new users hitting the network which serves to drive transactional value through the network. It’s only after the frenzy has subsided do we see whether the value flowing through the network has kept in tandem with its higher valuation. Sometimes it does (it’s a consolidation), and in other times it does not (hence, a crash). Using the NVT ratio we can detect the difference between consolidation and bubbles very visibly. If the NVT ratio stays within a normal range, we are not in bubble territory. If it climbs above the normal range, it's a sign that the transactional activity is not sustaining the new valuation and we can expect a lengthy price correction. 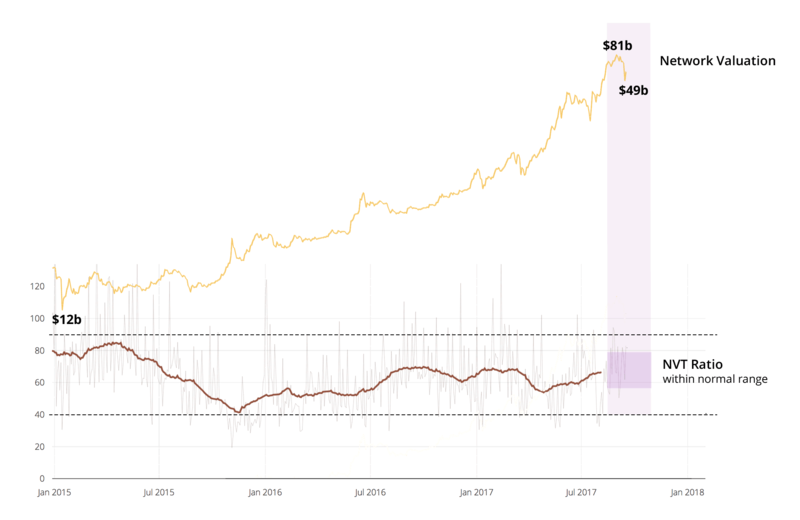 The chart above shows the NVT ratio in action detecting two of Bitcoin's historic bubbles. In 2011 and early 2013, Bitcoin exploded in price followed by NVT ratio rising above the normal range. These were deemed bubbles under NVT ratio analysis. Subsequently we saw lengthy 92% and 83% corrections in price. Of particular interest is the first rapid price rise of 2013 (highlighted with a rectangle in the chart above). We saw a 83% consolidation from peak to trough. It's interesting as the NVT ratio did not rise high enough to signify a bubble, yet you would think a 83% correction would be fit to be called a bubble, right? Not so! If we dig into the network’s undergrowth, we find that the value transmitted by the network was high enough to keep the NVT ratio within normal range. Though the markets sold off until the price experienced a sudden dip that was 83% off the peak, that dip was very short lived and the long range chart reveals a pattern more akin to a consolidation which completed quicky. This is a case where the NVT ratio, had it been around back then, was telling the markets it was undervaluing the network at the peak of market fear. Hey NVT, are we in a bubble today? Now for the golden moment - let's apply the NVT ratio to test the Bitcoin's market at the time of writing. We've suffered a large pullback from $81b network value to a low of $49b, with market fearing the potential onset of a bear season. As we can see in the chart above, NVT ratio is within normal bounds. NVT ratio is saying this is a price consolidation. 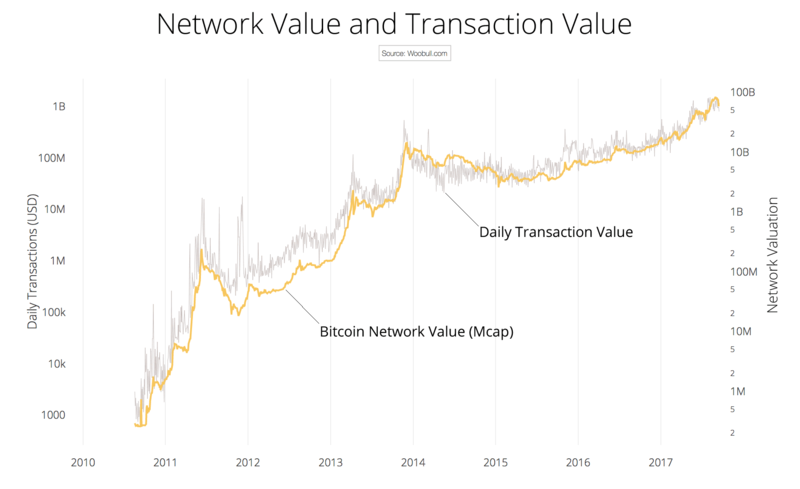 The transaction value flowing through Bitcoin's network is perfectly healthy and supports the currenct valuation. NVT Ratio on other crypto-assets? 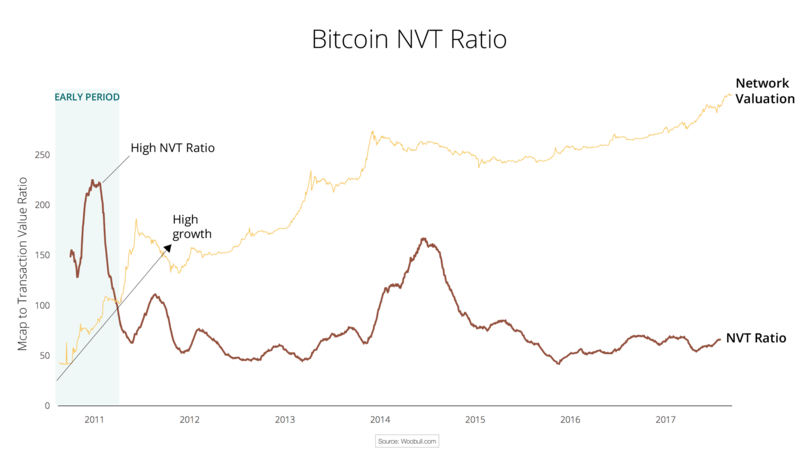 The question arises, can NVT Ratio be used as a valuation metric for other crypto-assets? My tentative answer, subject to further study, would be “usually, but not always”. At its essence, Bitcoin’s NVT ratio is a comparison of how much the network is being valued to how much the network is being used. If you’re applying the NVT ratio to a different network, the value transmitted on-chain needs to be a good representation of how much the network is being used. This is not always the case. Ethereum launched in 2015, as a smart contract computing network that's fast become the most popular platform for token sales this year. 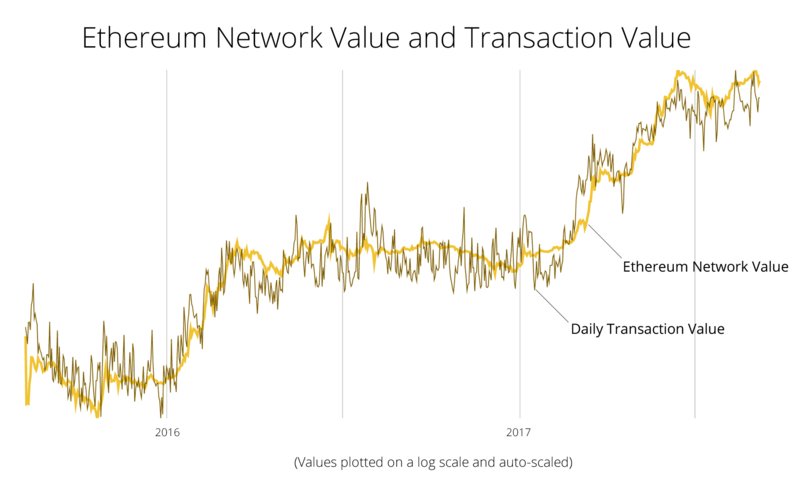 Since the token sales conducted on Ethereum require payment in Ether, there's a very strong correlation between the transactional value and network value as seen below. Ethereum is only two years old and its high growth phase. It will take some time before its NVT ratio settles into a meaningful long term range for bubble detection. Networks like Decred and Dash have transactional activity resulting from staking, a process where stakeholders of a network lock up and collateralise their tokens to provide services to the network in return for revenue. This revenue flowing back to the stakeholders is not reflective of the network’s utility and will skew the results coming from the NVT ratio. For these types of networks it would make sense to provide a corrected NVT ratio which subtracts the transactional value resulting from staking which is numerically predictable. Private and fungible currencies like Zcash and Monero hide some, or all of their value transmitted on-chain so it’s impossible to determine their NVT ratio accurately. This article was first published by Forbes on 29 Sep 2017. Purists may argue other use cases that presents transactional data onto the Bitcoin blockchain, such as notorisation or even the basis for token platforms in the case of CounterParty and OMNI Protocol. But this actual USD value transmitted is insignificant, meaning it does not significantly impact this metric.